This was to be one of the most surreal gigs I can remember. 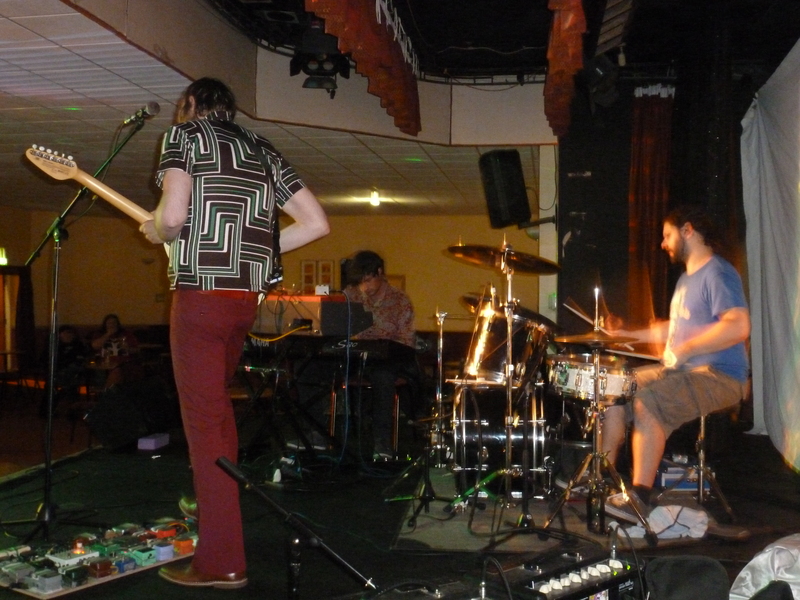 Rotherham is hardly the epicentre of English psychedelic music yet the town’s Trades venue was selected as the place for German’s mighty Vibravoid to strut their stuff in the north. Dates in the UK are few and far between for Christian Koch’s band so the very idea of missing one within an hour of my home was dismissed quickly enough. Tickets were – to my astonishment – a mere £4 each. Booking fee was 40 pence. Certainly the best value ticket in history for me – the idea of 2 people getting in for less than £9 seems ridiculous in this day and age. Rotherham Trades is something of a Tardis. An unassuming building at the end of a shabby street overlooked by a motorway suggested we may be in the wrong place, but a small bedraggled group huddled outside suggested this was in fact the venue itself. Stepping inside the place opened up into a vast room that didn’t seem possible from the outside. 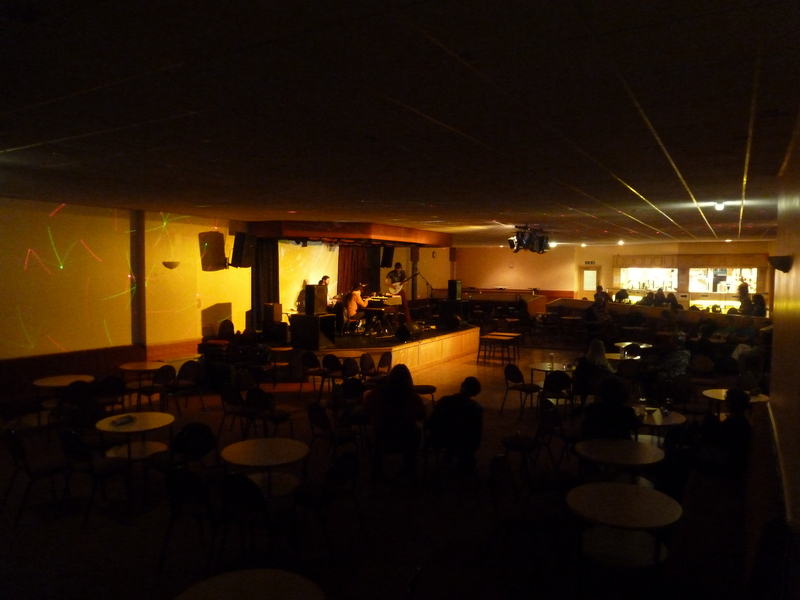 But everyone was friendly and as it was a social club the bar prices were more than reasonable. On the other side of the bar itself was the standard room in which a group of older regulars sat sipping pints. 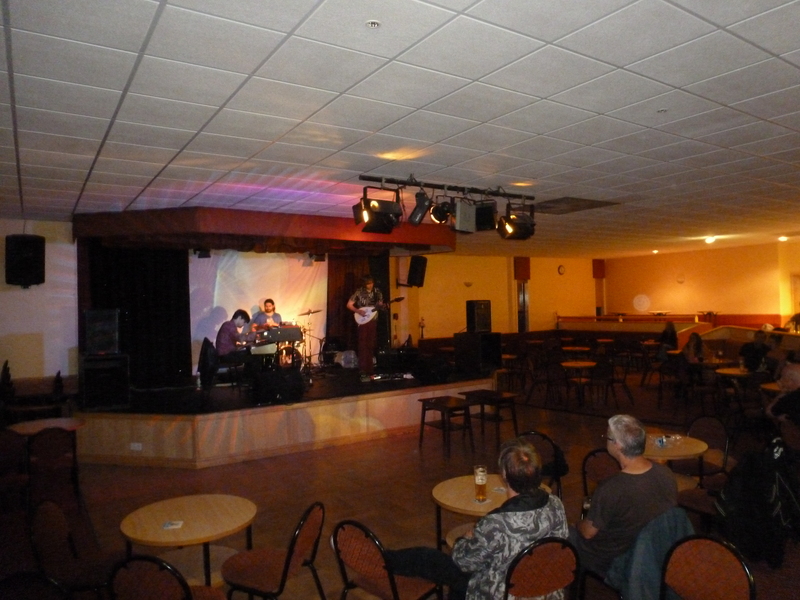 Even when Vibravoid were at their raging noisiest this group seemed unmoved by the vast wall of noise emanating from the main room, and sat quietly enjoying their evening. As Christian and chums assembled their compact gear the only hint of the carnage due was the largest guitar effects pedal board ever seen, with a good 30 or so pedals sitting squashed together in innocent enough fashion. Christian himself set up the back-stage projector and at around 10 p.m. the bubbly oils illuminated the place and the 3 members of Vibravoid – guitar, keyboards and drums – began the steady build-up of their set. It was mesmeric from the moment they started. The opening track – unknown to me but then the back catalogue is a sprawling and confusing list – built carefully, with further layers of guitar being added to the basic sitar drone, with occasional flashes of power and sound. By the time it got to where it had been headed it was a vast shimmering sheet of effects and wobbles. It was around this point a friend sent me a text asking how many punters were there. So I counted them and sent back the simply reply: ‘27’. The very thought of this still makes me shake my head. Hardly anyone in the UK has seen this band live as they have played here so rarely, and although Rotherham was a surprising place for them to appear, I expected more people than this. The staff almost outnumbered the paying customers. At its peak the audience numbered almost 40. I don’t really like to sit at the back of a venue, even when numbers are this low, so I found myself totally alone on the dance floor, absorbing the throbbing noise in solo fashion. And what a noise it was. The band’s Vox monitors were far louder than the venue’s PA and the band had them set up so they were good and loud. I am disappointed so often with the guitar sound at live shows but at this one every squeal, squawk and howl Christian’s Vox Apache made was beautifully clear. 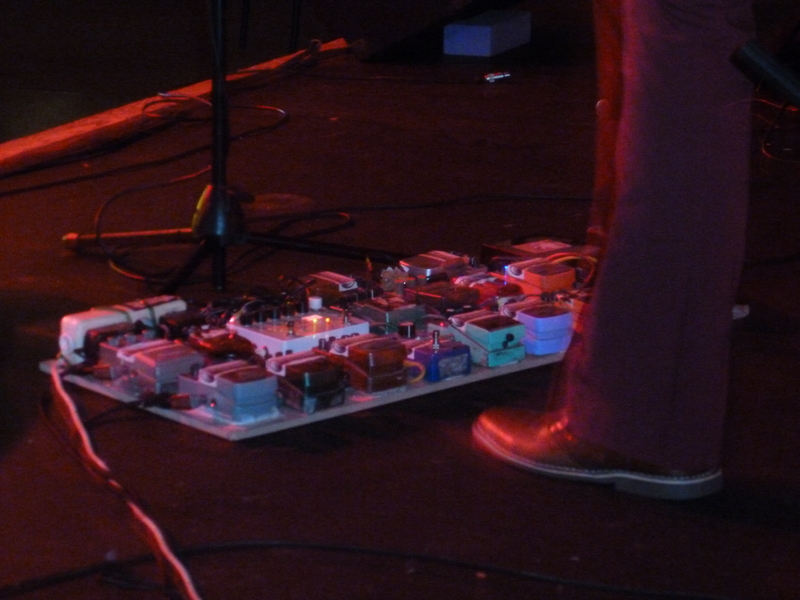 His feet skittered about his pedal board, dragging in all manner of guitar sounds. At one point he made this extraordinary oscillating noise that warbled about the place yet he was still able to produce a mighty fuzz crunch at the same time. The set consisted of only 7 or 8 songs, but each one was stretched and manipulated to the maximum. The general sound was the kind found on the band’s magnificent Minddrugs album, and indeed ‘Seefeel’ appeared in terrific fashion, sounding better than ever. Watching the drummer’s euphoric focus and the keyboard player’s head-down stance at this point showed the gel there was between the band – each was aware of the space available for them to do their stuff in, with guitar taking centre stage but the bass keyboard adding a particular gut-throb to proceedings. The cover of Australian psychonauts Tynaround’s ‘Color Your Mind’ was faithful to the original but enveloped in classic Vibravoid fuzz and effects – hardly an obvious choice. The mighty ‘Ballspeaker’ pounded its way into the middle, but the highlights were 2 blistering acid punk tracks. The first was ‘Magic Mirror’ which sounded like The Heads at their finest. A brutal riff-orientated tour de force that peeled the skin off your eyeballs. Absolutely sensational. I have no idea what the second one was but if anything it was even better and the sensation of one’s stomach being pummelled never felt better. As a closing treat the band delivered a very motorik ‘Mother Sky’, and why not? This song was built into a monstrous whirl of noise before it was totally deconstructed down to a few worrying sounds and general chaos before, in the blink of an eye, they hurled it back together so the finale was a massive pumping rhythm. The sparse group watching applauded politely but it was clear that the set was sadly over. Quite how a band find the momentum and attitude to deliver a set like that to so few people remains a mystery. I saw Kinski do the same thing to about 20 people in Leeds many years ago. You have to hand it to musicians who can pull that off as there is little or no energy to feed off from the crowd (and in this instance crowd is hardly the most accurate word to use). 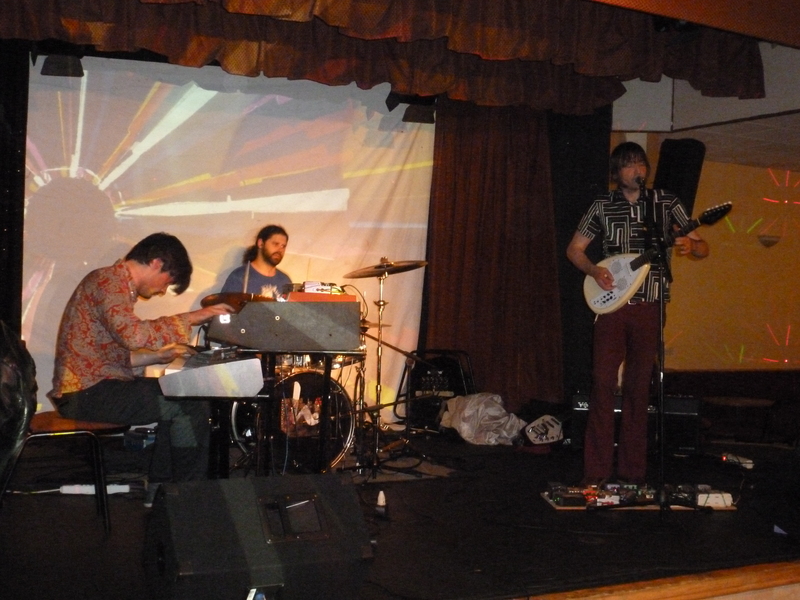 But Vibravoid delivered in fine fashion, ignoring the lack of people and instead just playing how they wanted to. I hunted around for a set list – partly as a souvenir but also because I have to find out what the second punk track they played was! 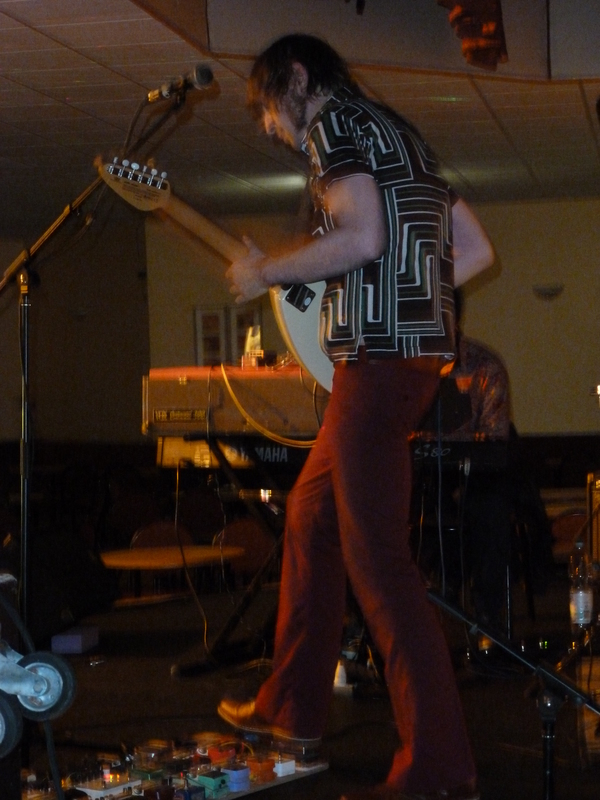 A few tentative enquiries through Facebook have yielded very friendly responses but nothing definitive on the set list as, according to Christian ‘we usually have none as we just get on stage and play what we like…’. With audience numbers as low as this it’s easy to see why Vibravoid prefer to ply their trade on the continent, although the 3 band members looked happy enough afterwards. They have a solid following in their native Germany but also go down very well at festivals such as Roadburn in Holland. If they come all this way are find themselves booked into a place as small as Rotherham – which is a fine town in its own right but hardly the most suitable choice – you wonder if they is any incentive for them to return. That makes the set I witnessed even more special. Next time I’ll travel a lot more than the comparatively short 100 mile round trip. That band is well worth it.